Buy our UNLIMITED MONTHLY Open Studio pass here. This offer is only valid for Air Temple STUDENTS. Open Studio is a self-directed training time for students comfortable on their apparatus to stretch, condition and practice skills. Though there will be an instructor present this is not a time to attempt new skills. In Open Studio students are only to work on skills they have covered in class. Absolutely no teaching allowed. 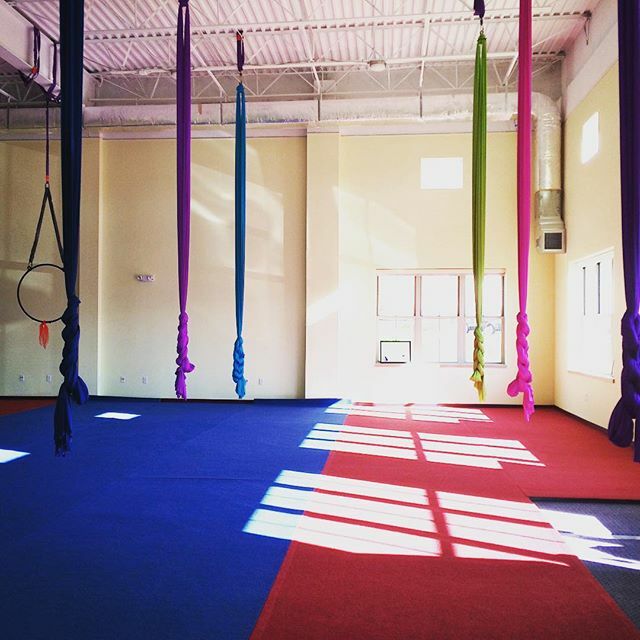 For Non-Air Temple Students: Practicing aerialists are welcome to take advantage of our Open Studio times or set up a rigging-point rental. Non-Students wishing to participate in Open Studio MUST complete an assessment to ensure safety and competency PRIOR to participating in Open Studio. The assessment must be scheduled with management prior to arrival. In some cases the assessment can be waived with submission of a video demonstrating the aerialists skill. Cost for current Air Temple Students: $10. Cost for non-students: $15. Dedicated point rental: $20/hr. Payment for PR/OS is due prior to starting to practice, unless other prior arrangements have been made with management. Individuals wishing to rent point time must make an appointment with the studio prior to renting point time. Non-students wishing to rent point time or participate in Open Studio must book an appointment to complete Air Temple’s studio orientation before renting point time. The cost of Open Studio is $10 for the duration; the cost of point rental is $20/hr. Open Studio is meant specifically for current students at Air Temple to review what they’ve learned in class. For non-Air Temple Students the cost is $15. All rigging (this includes pulling down silks etc.) is to be done only by Air Temple staff, unless the student has completed the Studio Orientation with an Air Temple staff member. Open Studio is moderated, not taught. Open Studio is not the time to try new tricks or try to work through something that you don’t remember. You are not to work on any apparatus that you have not taken class in. You may be asked to move during a class if the class needs the space you are using. We intend to rent point time when it is most convenient for the point renter. If there are conflicts with scheduled classes we will evaluate for a better time slot. While class is in session we ask that you maintain a quiet, professional atmosphere. Loud noises or interruptions are distracting to students and disrupt the flow of a class. Point time must be scheduled prior to arrival. If you come in to rent point time while a class is in session, you may have to wait until a staff member has a break and is available to assist you. We do allow individuals to wear earbuds while they practice, however your music must be at a low enough volume that Air Temple staff will be able to easily get your attention if necessary. Air Temple does prohibit certain release moves, slack drops etc. in the studio. If you’re not sure if a move you are practicing falls into this category, please check with Air Temple staff before attempting the trick. Air Temple staff members have the final word on safety. If a staff member at any time has concerns about your ability to complete a trick safely, they are within their rights to ask you to cease attempting the trick(s). If the staff have repeated concerns about your safety you may be asked to no longer attend Open Studio or rent point time. Crash mats must be used under all aerial apparatuses with no exceptions. All studio policies regarding studio conduct, etc. applied to session students, also apply to individuals renting point time. 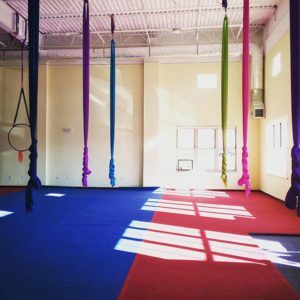 Individuals who come in for OS/PR may bring friends (within a reasonable number), but non-experienced aerialists will not be allowed on any apparatus. Absolutely no teaching in the studio is allowed, except by Air Temple instructors. Open Studio is a privilege, not a right, and students who have trouble following the above guidelines may be asked not to attend Open Studio.